Concepcion finally gets his first title shot vs. Luevano! Bernabe “Real Deal” Concepcion (28-1-1, 16 KO’s) battles WBO featherweight champion Steven Luevano (36-1-1, 15 KO’s) on the undercard of the “Battle of the East and West” headlined by Filipino boxing hero Manny Pacquiao against Britain’s Ricky “The Hitman” Hatton at the MGM Grand in Las Vegas on May 2. Top Rank promoter Bob Arum told insidesports.ph, Standard Today and Viva Sports that he changed his original plan of staging the Concepcion fight on his April 25 card in Puerto Rico and moved it to May 2 because the April date was “no good, because trainer Freddie Roach wants to be with Concepcion” in his corner. Arum said “obviously that’s a very important fight” for Concepcion but since it will take place during the training of Manny he decided to “accommodate everybody” by moving the Concepcion-Luevano title fight to May 2. The 21 year old Concepcion who is managed by Aljoe Jaro in partnership with Pacquiao and Pacquiao adviser Michael Koncz is coming off a 5th round technical decision win over gutsy Sande Otieno in a clash for the vacant WBC International featherweight title with Concepcion who was having a hard time making the super bantamweight limit of 122 moving up to featherweight. Concepcion opened up a bad cut over Otieno’s right eye in the third round with a hard right and bloodied his face in the fifth forcing referee Bruce McTavish to call a halt on the advise of the ring physician. Concepcion, the hard-hitting title prospect fought four times last year and won all four but had a tough time against Mexico’s Giovanni Caro over whom he scored an 8th round knockout after the ring physician had wanted to stop the fight in the previous round because the Filipino’s left eye was almost totally shut. One report on the fight said that sensing urgency after seeing the doctor, Concepcion urged on by Pacquiao fought ferociously and landed a left-right combination that put Caro on the canvas for good. Luevano is a 27 year old southpaw who won the title with an 11th round knockout of Britain’s undefeated Nicky Cook on July 14, 2007. He was held to a draw in a title defense against Mario Santiago last June 28 and in his last fight successfully defended his crown against Australia’s Billy Dib with a fairly comfortable twelve round decision. Luevano is known for his speed and boxing ability and uses his left straight effectively although he doesn’t appear to have the power of Concepcion. Recently crowned World Boxing Council International Featherweight champion Bernabe Concepcion will be guest of Mayor Santos “Doc” Zafe when he passes by the capital town of Virac tomorrow afternoon on his way to a much-needed vacation in Viga. Concepcion, who celebrated his 21st birthday yesterday (Jan. 20) and his party of seven will arrive via commercial flight from Manila Jan. 22. He will be joined by Mayor Zafe and other key town officials in a motorcade around town prior to a brief program at Plaza Rizal to honor his exploits in the ring. Zafe told the Tribune that the province’s only world boxing champ had wanted to arrive today but he (the mayor) asked him to come a day later as the Zafe couple is marking their wedding anniversary today. Recently, Abe scored a technical knockout over Kenya’s Sande Otieno in a fight the Philippine fighter controlled right from the opening bell until the end of the eighth round when the Kenyan’s handlers decided to throw in the towel. Concepcion (28-1-1, 16 KOs) may take on WBO featherweight champion Steven Luevano (36-1-1, 15 KOs) or WBC champion Oscar Larios (63-6-1, 39 KO’s) in the next few months. A slot in the undercards for the endangered Pacquiao-Hatton showdown in Las Vegas on May 2 could also materialize. Bernabe Concepcion is now Ring magazine’s #10 Superbantam! It was quite frustrating how Ring Magazine seemed to have been dismissing 21-year old Bernabe Concepcion as a legit prospect despite being the NABF and WBC youth super bantamweight Champion for some time now, as well as being highly rated by the WBC as well as the WBO. So it was really surprising when I opened Ring Magazine’s December 1 update of their rankings to find out that Concepcion is now rated #10. It has been quite a year for this kid, fighting four times, stopping all his opponents except for current NABF featherweight Champion Juan Ruiz, who he outhustled in a 12-round brawl. He represented Philippine boxing well this year, earning the respect of Mexican fight fans when he fought twice Mexico, as well as the US boxing fans with his head-turning performance in the Cotto vs. Margarito undercard, where he made believers out of HBO commentators Kellerman, Stewart and Lampley. It is sad to realize though, that Concepcion’s apparent gain comes by way of another Filipino prospect’s loss, as local rival Boom Boom Bautista (who was erstwhile Ring Magazine #8 superbantam) was apparently stricken out of the rankings because of his poor showing against unheralded Mexican bantam journeyman Heriberto Ruiz. 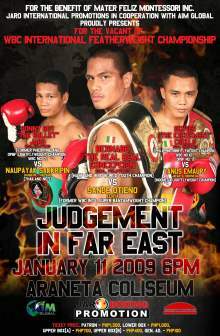 I hope 2009 will be a better year for Philippine boxing. We have a couple of capable legit contenders who are poised for a title shot and I hope we add to our current number of champions next year – something we failed to do this year. Congratulations Bernabe “kamaong llave” Concepcion for finally getting Ring Magazine recognition, you really are the REAL DEAL. click here for Ring Magazine’s current superbantam ranking.